I have been working on Red by Mirabilia this week. I am really happy with my progress as I stitched over three diagonals. 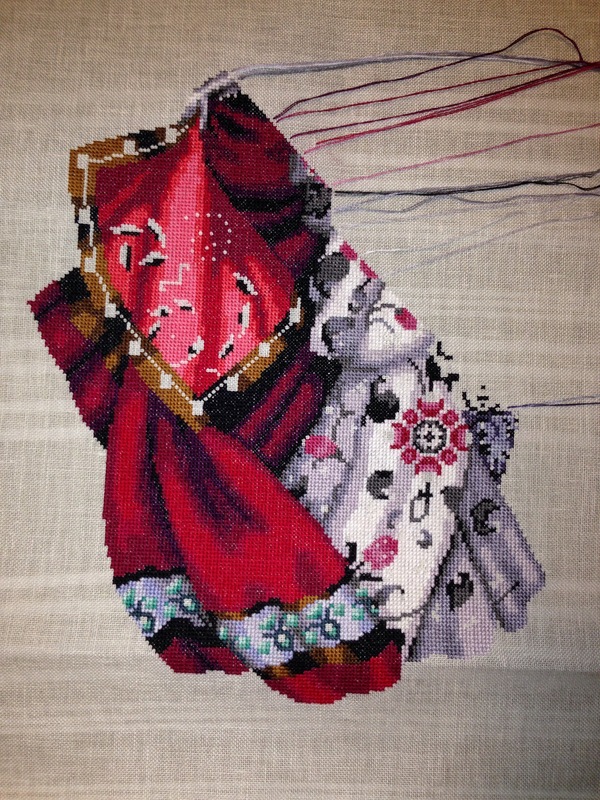 Her arm is starting to appear and I have also started another section of her dress. 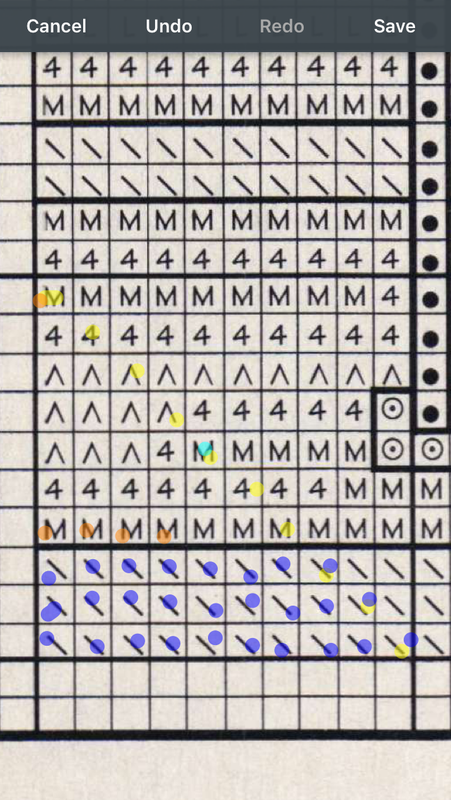 I am stitching this section horizontally because I don’t want the color variation in the Caron Waterlilies to put diagonal stripes in the dress. I really love how everything is starting to come together. I have been working on Verandas of South Battery for the last week. I am happy with my progress. I finished the third house and am well into the fourth house. The fourth house is blue. 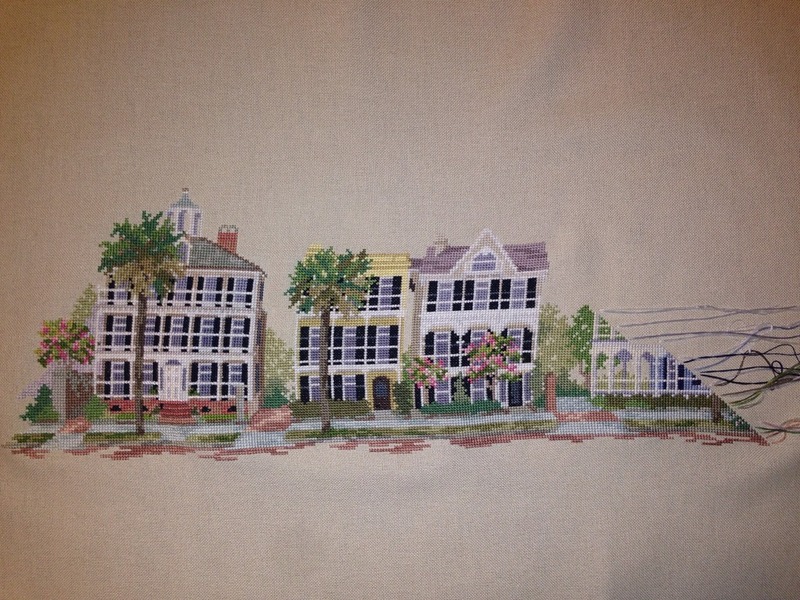 After stitching two white houses I am excited to be stitching with another color. I did a little research this week and found out that these houses actually exist in Charleston, South Carolina. They are on South Battery Street, across the street from White Point Garden. You can pull up Street View on Google Maps and see what they actually look like. A couple of them also have Wikipedia entries. 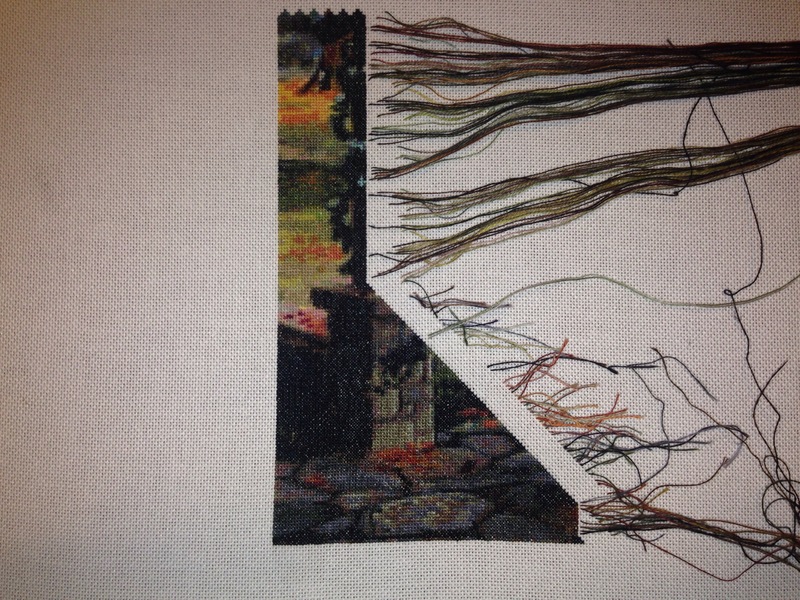 It is kind of exciting to be able to see what I am actually stitching. UPDATE: I have uploaded a video to YouTube that also talks about how I stitch diagonally and how I park. I have started to get questions on Instagram about how I stitch. I have decided to post the details here so that I have a place to refer people to when I get the question. I park and work in a diagonal across the page. There are several reasons why I do this. First of all I think that it helps my stitches to be neater and more uniform. It also avoids the ridges that can develop when you work in straight columns or rows. Second, in general it reduces the number of threads that I have parked at any given time. Third, I think that it gives more variety to what I am working on within a given pattern and it gets me to where all of the action is more quickly. Fourth, I find it to be more fun and I like to see the picture develop this way. I didn’t always stitch this way. There was a time when I started in the middle and worked outwards. I worked a lot slower back then because I would spend a lot of time counting and fixing mistakes. I also spent a lot of time deciding which color to stitch next. If there was a lot of confetti in the piece I would become stymied trying to see how the colors flowed through the pattern and I would constantly miss stitches that would have to be filled in later. I would stitch for a couple of hours and it would look like I hadn’t done anything. 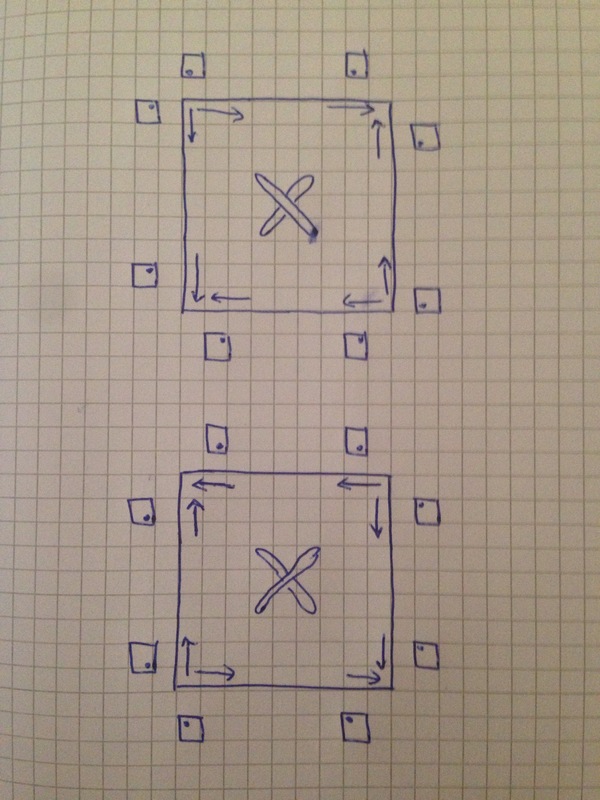 When I learned about parking and stitching in 10×10 blocks I found that all of these problems disappeared. I felt free to stitch like I never had before. Since then I have made adjustments to the way that I stitch through trial and error. Below is what I have learned from that. A tutorial on how and why to park can be found here. When I first read this the one question that was left unanswered for me was how to apply this to a complete pattern. It seemed impractical to do this across an entire row at once. My solution to the problem has been to work in diagonals. First of all, I decide where I am going to start stitching. I prefer starting in the lower left corner of the design but you can start at any corner. 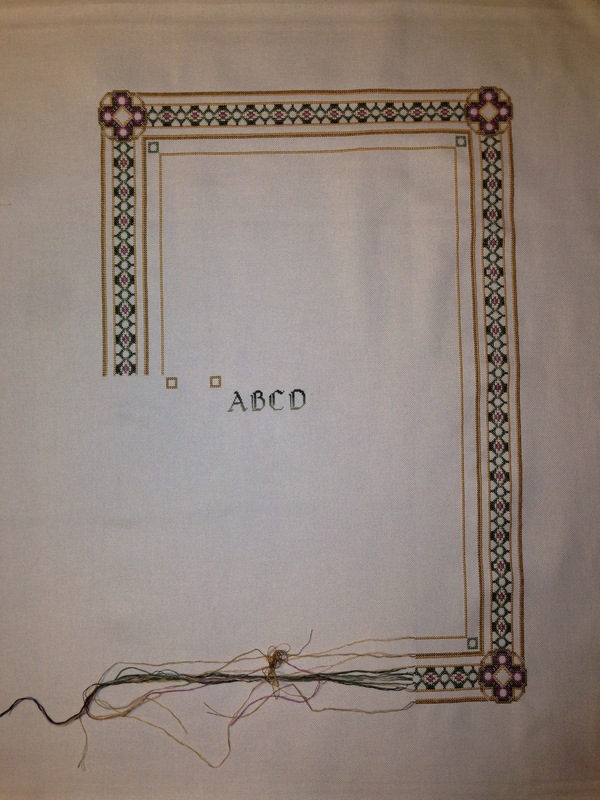 I also decide whether to stitch in rows or columns. My brain seems to think in columns, so that is the way that I stitch. My crosses look like the cross on the top. The arrows indicate which direction to work. So if I am going to work in columns and I am going to start in the bottom left corner I am going to work from top to bottom. That means that I will start at the top of the column and make the first leg of the cross going down and then make the second leg going back up the column. The little boxes indicate where the stitch starts. In my case that means that the first leg of my cross will be from top right to bottom left. A rule of thumb that summarizes all of this is that the needle comes up in a hole that has zero or one stitch already stitched there and goes down in a hole that has two or three stitches already stitched there. From the article that I linked I made a rule that I never enclose an empty stitch on four sides. 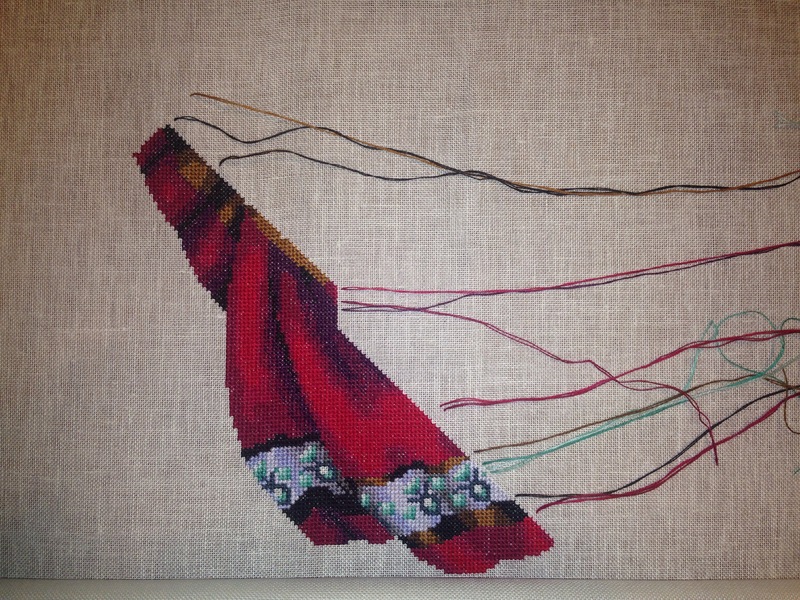 So I choose one color in the first column and stitch as far as I can go before I change to another color. I am going to step through how I would start to show what I mean. 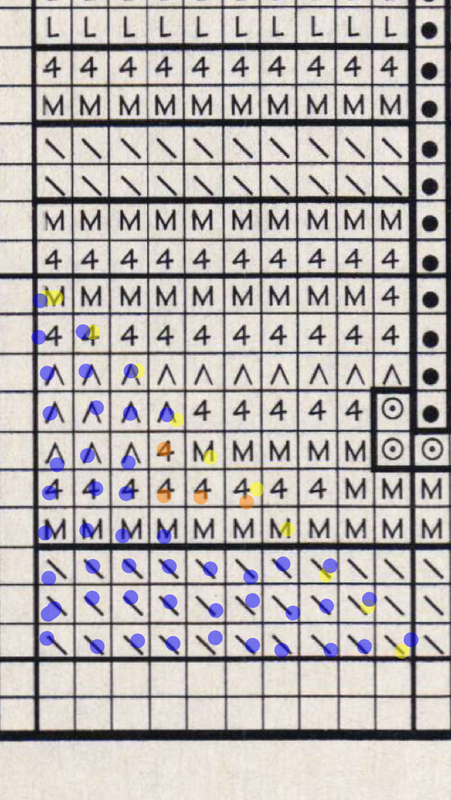 I always make sure that my diagonals run through a 10×10 grid on the chart. That may mean that the corner is a little bit larger or smaller than the ideal that is seen here. I then make a decision on which color to start with based on how the colors run with the design. In this case I am going to start with the ‘\’. This highlight is only to easily show what I am doing. I don’t highlight as I stitch, I only mark sections as I complete them. Here I am going to stitch the stitches in orange in columns and I am going to park the thread in the stitch with the light blue highlight. I could park where the same color starts above, but that is a long carry and this color block definitely continues on horizontally. Next I am going to stitch the ‘M’ stitches. Once again I stitch the orange highlights and park in the light blue highlights. I don’t stitch that stitch because there is an empty stitch to the left and stitching this stitch would eventually box it in. 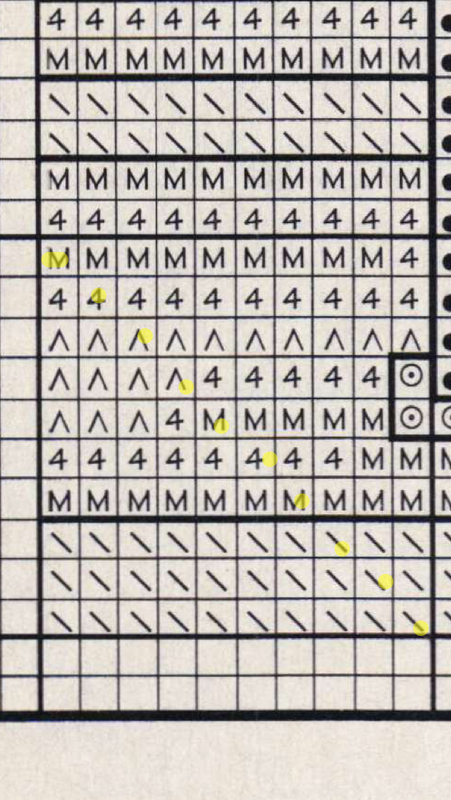 Next I am going to stitch the ‘4’. I am parking and waiting for the ‘^’ to be stitched before I continue on. Here I am parking for the next diagonal. I generally prefer to not park to the side like this, but sometimes the colors run that way and I hate ending a strand only to start one up again. Next I will finish the ‘4’. Here I am going to end off because there isn’t a good place that I can seen in the next diagonal where this color starts. Finally I will finish with the ‘M’. And now this triangle has been completely stitched. Time to move to the next diagonal. This time I will be stitching a parallelogram instead of a triangle. So that is how I work diagonally. When there is a lot of confetti it can be a pain to be constantly threading and unthreading needles. To mitigate this I have kept needles live. I have had up to six needles threaded at once. However, this can create its own problems as I find that threads tend to tangle more easily if they are weighed down by a needle. The other disadvantage to all of this is that the back will be messier. That doesn’t really bother me. Here is a video by someone showing how she parks threads. I think that this would make the back a little less messy, but this method also means threading and unthreading needles even more. There are a couple of exceptions to all of this. If I am working 1-over-1 then I don’t worry about closing in empty spaces. I just choose a color and stitch all the stitches of the color in the area I am working. 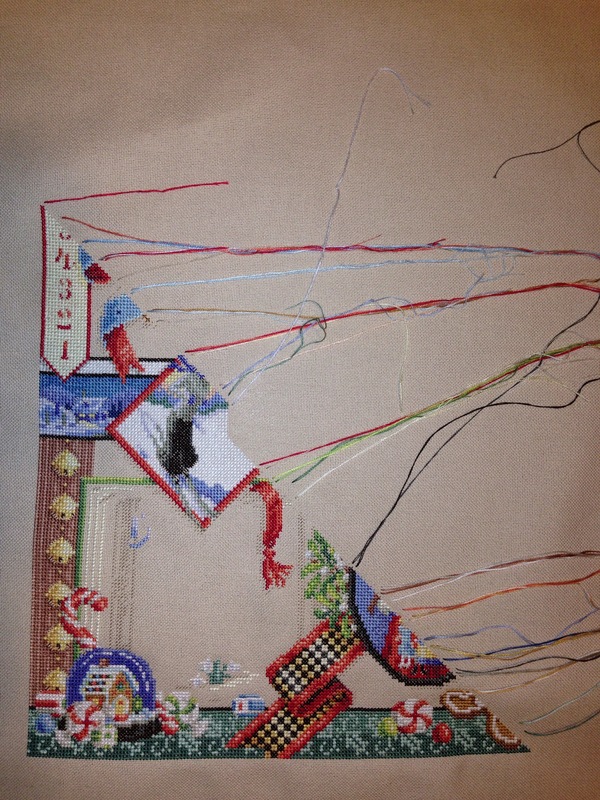 Also, I don’t think that I would stitch diagonally like this if the piece I am working on has a lot of “white space”. 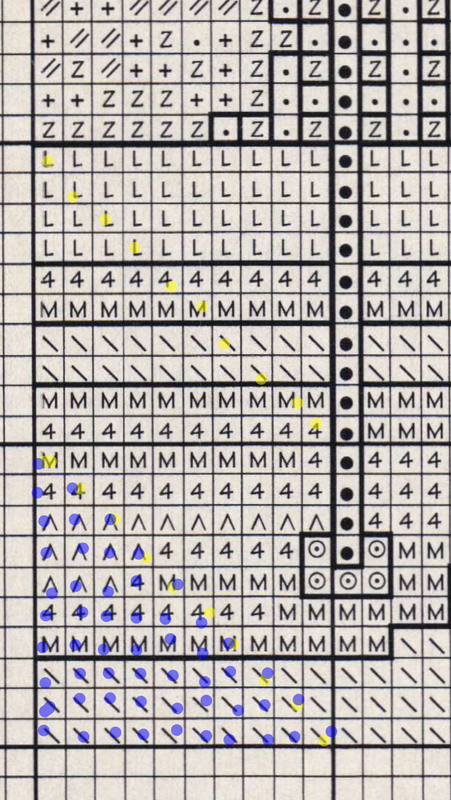 For example, if I were stitching a sampler, I think that I would stitch each letter individually and I wouldn’t worry about parking or any other techniques. Congratulations if you have made it to the end of this post. If it seems a little long-winded or technical, it is due to the engineer in me. Feel free to use of ignore any of these tips. Comment below with any questions or suggestions for improvement. I am always looking for ways to improve my stitching. I finished another diagonal tonight. The cloak is showing up even more and I like the folds that are showing up. 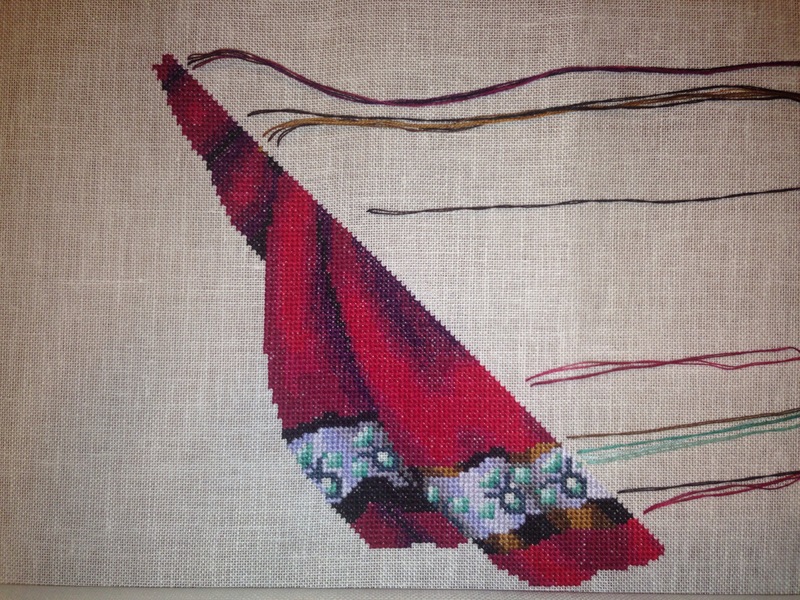 I am glad for the border of the cloak as it breaks up all of the red that I have been working with. I really like the border too. The greens there make it almost luminescent.